The Shimano AX Spinning Reel. The QuickFire II lever is shown in use. It always stops at the top when you wind the handle backwards. One of best value-for-money trout spinning reels available on the New Zealand market is the AX Series from Shimano. Priced at under $100 they represent good buying from a highly respected manufacturer. The AX1000 and AX2000 both have a slightly higher gear ratio at 5.2:1. 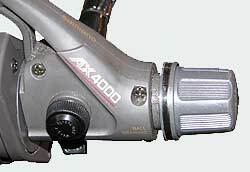 The AX4000 gearing is 4.6:1. Each model has a single stainless steel ball bearing located on the side of the main drive gear. Construction is of light­weight and super strong graphite. The Shimano AX spinning reel is perfect teamed up with the Shimano Catana 792. A particularly important feature of the series is Shimano’s Dyna-Balance System. This hi-tech innovation involves clever counter weighting of the rotor assembly to prevent the wobbling typical of ‘egg­beater’ type reels. The system works! It produces a surprisingly smooth action even when you wind flat-out. The rear drag can easily be adjusted even with a fish on. Do the knob up tight to remove spool. I chose the model AX4000 and felt that it offered the best all around size for the sort of fishing I would use it for. It has sufficient line holding capacity, to be in its element making long casts for land­locked Quinnat salmon at Lake Coleridge, and at the same time would be an excellent choice when spinning for trout in the Waimakariri River . The AX4000 is a great first trout spinning reel for youngsters being of a good size for most situations, whilst offering robust construction and value for money. The AX series reels are packed with desirable modern features. The first, and perhaps most notable of these is the rear operated drag system. A rear drag is much easier to use when fight­ing a fish. You can easily make adjust­ments as the fish is running. When you turn the handle backwards the anti­reverse automatically stops the rotor in just the right position for your finger to grab the QuickFire II trigger. With the same finger, and in the same motion, pull the trigger (which flips the bail), and you can grab the line. You’re ready to cast! It is that sim­ple. It works every time and would be a big help to a complete beginner. The QuickFire II feature is a brilliant idea. If you cast with your right hand and wind the handle with your left, or vice-versa, you don’t even have to change your hand positions to cast and retrieve. I’m one of those oddball types that cast and retrieve using the same hand – in my case the right – and so must pass the rod from my left hand to the right hand in order to cast. I could do this with­out fuss simply by winding backwards with my right hand, then lowering my forefinger on my left hand as it gripped the rod, down to the rotor to hold it in place as I changed grips from left hand to right. This might sound complicated but in practice is very simple. The handle can be unscrewed and changed over to the opposite side of the reel for those who are left-handed. If you loosen the handle screw cap it allows the handle to fold over to make the reel into a smaller package for transportation. The spool can be removed by tighten­ing the drag and unscrewing the spool in the direction of the arrow marked for this purpose. There is no chance of the spool coming off when fighting a fish because the spool tightens in the other direction. Even if you forget to tighten it, a fish pulling line will do it for you! 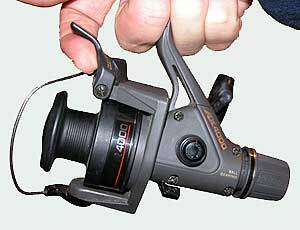 In the more ex­pensive, rear-drag Shimano reels a button is pressed to remove the spool from the reel. The Shimano AX Spinning Reel series and been made a sold by Shimano for over a decade. This reel is a top performer. Don’t be fooled by its budget price tag!